Going vegan can be easy and delicious. Don’t believe me? 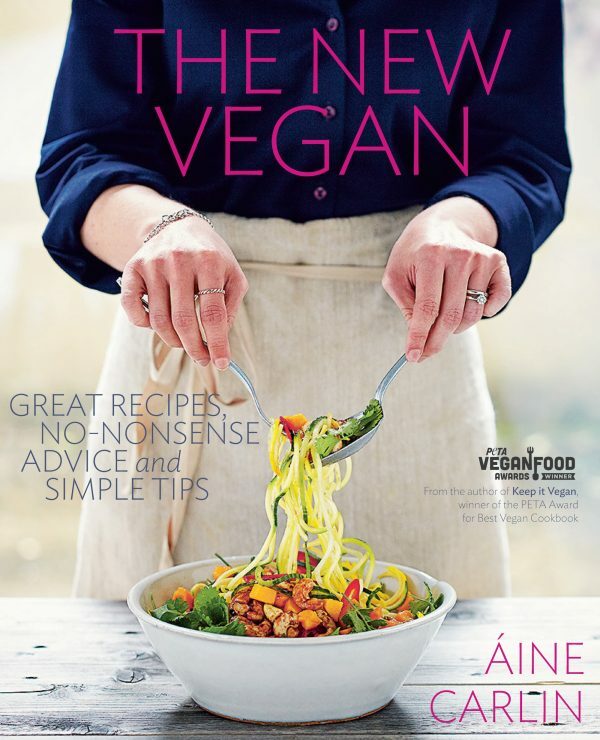 Check out Áine Carlin’s new cookbook The New Vegan. If you’ve been thinking about eating healthier or becoming plant based, that’s enough thinking! How about getting this book that doesn’t just have great recipes, but also helpful advice and tips to get you started. In The New Vegan, Áine covers the main questions and obstacles that people encounter when considering a lifestyle change: why vegan? what can I eat? how do I get enough protein? what about eating out? She also makes a vegan diet appealing with beautiful simple recipes, whole food ingredients you recognize, and easy meals. If you don’t already know Áine, she is the author of Keep It Vegan and the blog Pea Soup. She received the 2014 PETA Award for Best Vegan Cookbook and the 2015 Ground Awards for Best UK Vegan Book and Best UK Blogger. In other words, get to know this girl! She is more than qualified to write this essential lifestyle reference for novice vegans, and if you give this book a chance, you will be rewarded with practical advice and really good food. 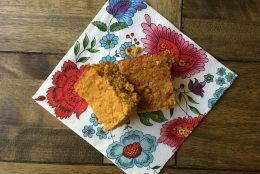 If you’re still on the fence, here’s a chance to get to know Áine a little better and try a recipe from her book. Read on! Your new book The New Vegan is aimed at guiding people through the transition to a vegan diet and lifestyle. You became vegan in 2010. Tell us about what your own vegan journey looked like. I would say I’m still on my vegan journey. Every day I discover new and exciting things about this lifestyle so it’s never static. My taste buds have adapted and evolved over the years too so things I ate several years ago might not feature in my diet so much now. I suppose I always had this lingering curiosity with food in general and that eventually led me to veganism. Living in Chicago had a huge impact on me, of course, and it made my vegan transition so seamless. It’s a huge foodie town and I was amazed at what was on offer but it also opened my eyes up to the realities of the industrialized food industry. I can’t remember the exact moment I decided to go vegan but I do recall it being something of an epiphany – I was so gung-ho about the whole thing I cleared out my cupboards and fridge in one fell swoop. I realize that other people prefer to inch towards veganism in a slightly less all-encompassing way which is why I wrote this book. It’s essentially the handbook I wish I’d had back when I first declared, ‘I’m vegan!’ so in a way, I wrote it for my former ‘newbie’ self. Although I should iterate, this book is definitely not just for new vegans … recipe wise, there’s a plethora on offer to suit all tastes and is super for seasoned vegans too. I often hear “I could never go vegan!” What do you say to those who think they are going to be hungry, deprived or miss out? Somewhere along the way we’ve perpetuated this skewed notion that veganism equals deprivation. Perhaps it’s because we’ve been collectively conditioned to think that a complete plate of food has to include meat and/or dairy but becoming vegan doesn’t mean you have to miss out on the things you enjoyed before. You might have to be slightly more creative about it and acquaint yourself with the dynamic range of produce at our disposal … rest assured though, all your favourites are still on the menu albeit with a plant based twist. 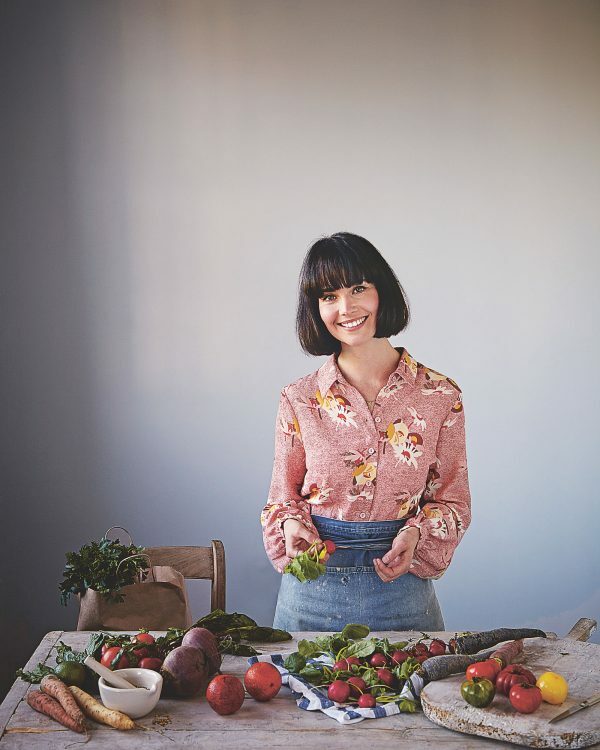 This book teaches you how to build a balanced menu with an abundance of wholesome plant based ingredients that are readily available to pretty much everyone – I tend to avoid items you have to purchase at specialist stores. We’ve also been taught to fear things like carbs – much of this thinking is tied in with the diet industry but since going vegan I’ve never once restricted myself … I left all that behind as soon as I embraced this lifestyle. 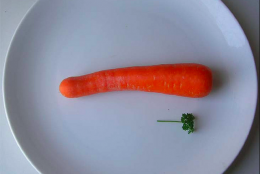 I eat a plentiful range of foods and rarely stress about whether I’m getting ‘too much of this’ or ‘too little of that’. Veganism has really given me back control of my diet and I rarely, if ever, ‘go hungry’. Also, there are so many readily available options these – whether you’re after a full-blown meal, snack or even an oat-milk latte, most places now provide something that we can enjoy. We’re now seeing more and more mainstream outlets jumping aboard the vegan bandwagon and that can only be a good thing … there’s definitely been a huge breakthrough lately, which is very exciting to see. Also, I too was in the ‘I could never go vegan’ camp myself at one stage so fully understand people’s hesitancy and reservations. What I would say is, if I can do it, absolutely anyone can. There are “junk food vegans” – people who don’t eat animal products but who choose sugary, refined products that don’t have much nutrition. What advice do you have to help people transition from convenient, packaged vegan foods to a more whole foods vegan diet? Get in the kitchen. Reconnecting with food on a more hands-on level is the only way to maintain a healthy lifestyle. I’ve found that previously reluctant cooks have discovered a new love for cooking when they go vegan because they can almost immediately feel the benefits. Also, there’s nothing so satisfying as creating your own pizza dough or whipping up a beautiful dairy-free dessert. 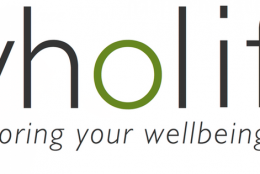 Convenience foods can be handy for when you’re in a bind or as an occasional treat but our reliance on them is worrying. I try to make my recipes as accessible as possible and people seem to respond to that. Getting a few basic dishes under your belt (such as a great curry or pasta dish) is fundamental, and as your confidence grows you’ll soon find yourself branching out. I tend to think that a good breakfast sets the tone for the day so if you’re filling yourself with coffee and donuts then it will inevitably impact your ensuing choices for lunch and dinner. Oatmeal and smoothie bowls are an absolute mainstay in my kitchen – I know that if I get the right fuel into me in the morning, the rest of the day is likely to follow suit. Wafer-thin but with a good amount of chew, these are the ultimate grab-and-go pancakes. They are so easy you could happily make them a weekday feature—and best of all there’s no flipping required, yippee! With a slight nod to India (I love my spices and can’t get enough of chickpea flour) these have pretty much surpassed any existing savory pancake recipe in my repertoire. I’ve gone for a lima bean filling because I wanted to keep this dish as straightforward as possible. Simplicity aside, the creaminess of the lima beans are the perfect pairing to the tangy crepes and the spinach is that final green flourish I can’t do without… although arugula would work just as well. 1. Coarsely mash the lima beans with the salt, lemon juice, and garam masala in a bowl and set aside. 2. Whisk both flours with the baking soda, sea salt, and turmeric in a bowl. Whisk in the lemon juice and water. Melt the coconut oil in a small heavy-bottomed frying pan and add to the batter. Whisk to combine. 3. Return the pan to the heat and when it has reached a medium-high heat, add just under half a ladle of batter. Swirl the pan so the batter meets the edges and cook until you see bubbles appearing on top and the edges look crispy. 4. Place a layer of spinach leaves, if using, in the center of the crepe and add a tablespoon of the lima bean mixture and a splash of your favorite hot sauce, if using. Use a spatula to roll the crepe. 5. 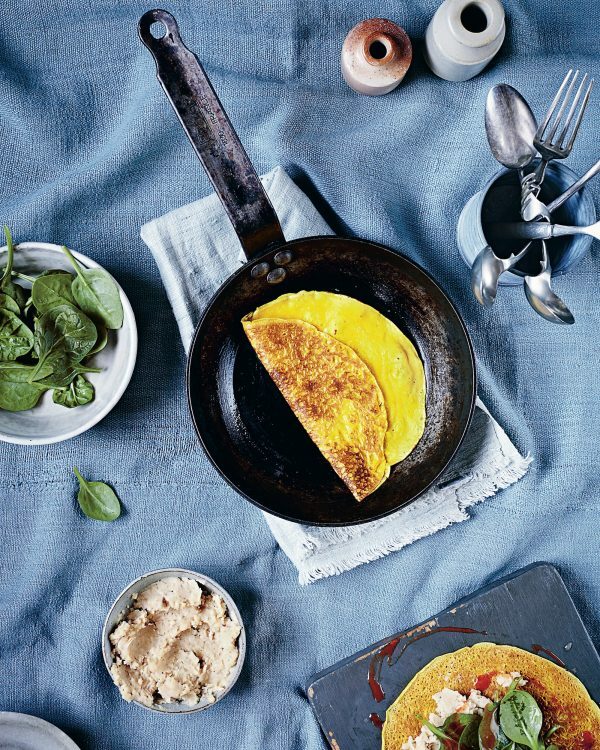 Carefully remove the rolled crepe from the pan and repeat. You can keep the crepes warm in a low oven or consume hot straight out of the pan. Let me know the story of how you became plant-based…or what’s stopping you!